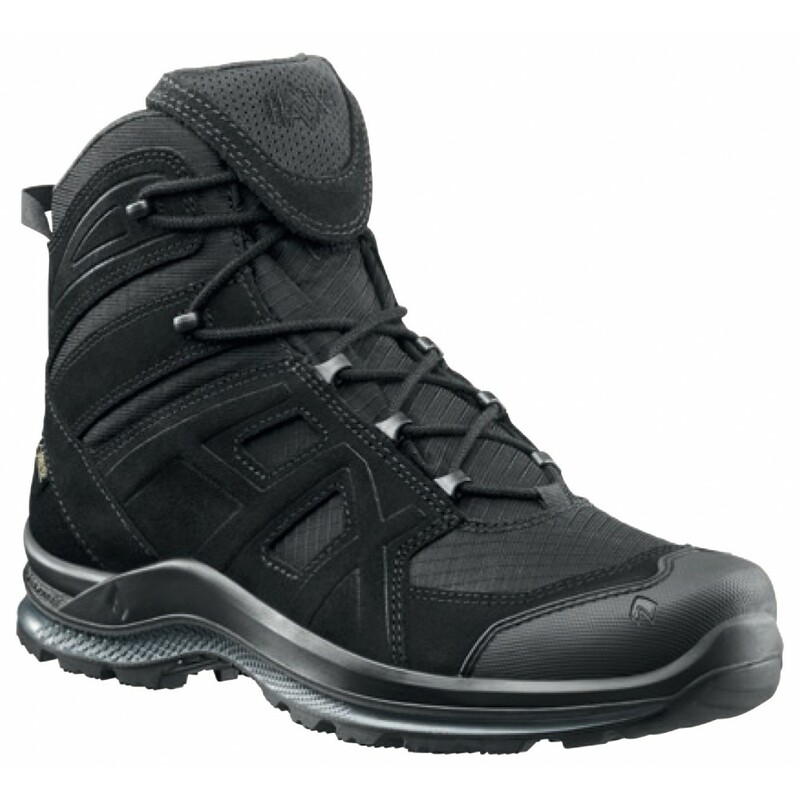 The Haix Black Eagle Athletic 2.0 V GTX are certified to the strict safety standards CE EN ISO 20347: 2012 O2 HRO HI CI WR FO SRC, durable and very lightweight, are ideal to protect as well as offer all-day comfortable and relaxing use During service, but also in any other activity. The Black Eagle Athletic 2,0 V GTX Mid boots of Germany's Haix Germany have waterproof protection thanks to GORE-TEX® Extended Lining. Three (3) layers of GORE-TEX® hydrophobic membrane that provides excellent tightness and ventilation, increased penetration of chemicals, blood and other organic fluids into the shoe, disperses heat and does not keep it trapped inside, prevents moisture from Penetrates but also eliminates any moisture inside. The Climate System uses foot movement in walking to keep air flowing in the shoe, allowing fresh air to flow through the ventilation holes at the top of the shoe and in combination with the friction-resistant climate Lining provide optimized comfort in all climatic conditions keeping the tread warm in winter and cool in the summer. The HAIX Black Eagle Athletic 2.0 V GTX Mid has an internal shock-absorbing bottom that absorbs moisture, absorbs sweat and quickly dries to provide antibacterial action and thus prevents unpleasant odor from bacteria. In the center of the heel there is a Pronation Support that prevents the foot flexing inward while the special Stabilizer offers extra support and stability to avoid ankle injuries. The sole with the Haix Black Eagle Athletic Athletic 2,0 V GTX Mid is integrated with the rest of the shoe with the Injection technique for longer life, since this method eliminates the possibility of detaching the shoe from the shoe. It consists of three (3) parts directly linked to each other, each offering something unique to the touch, making the German Haix the exclusive manufacturer of this kind of soles throughout Europe. The outer part of the sole is made of a highly resistant anti-static rubber compound that prevents water penetration (WR), is resistant to chemicals, oils and fuels (FO), provides insulation from cold (CI) Heat (FI) while it can withstand temperatures of 300˚C for 60 seconds (HRO). The intermediate part is a hard polyurethane (PU) layer with a stabilizing zone for optimized pressure distribution on uneven surfaces and pressure absorption by external factors such as stones. The third part is made of elastic polyurethane foam and offers a comfortable push and excellent vibration absorption at every step. Designed for optimum running performance, the sole offers excellent SRC and firm pressure on hard surfaces but also in mud, snow, even on cold roads, thanks to profile shaping and the specialized rubber used in its construction. The special system for fast cords fastening provides unmatched and comfortable fit all day long without any hardship, and Dynaframe technology helps absorb and damp the traction forces that can be created by the system while protecting the back of the tread. At the top of the cords there is a smart lace pocket to keep them stable and protects them from being caught anywhere. The Haix Black Eagle Athletic 2.0 V GTX Mid is made of a highly breathable combination of suede leather and microfibre cloth, passes metal detector controls with metal free, anti-static, ultra lightweight And do not leave marks on surfaces such as light tiles or sensitive floor coverings.